Meet one of the Civil War’s most colorful units, the Zouave. Patterned after the French military the Zouave uniforms cut such a martial appearance they were a popular uniform for militia companies. Zouave units were not limited to the North. 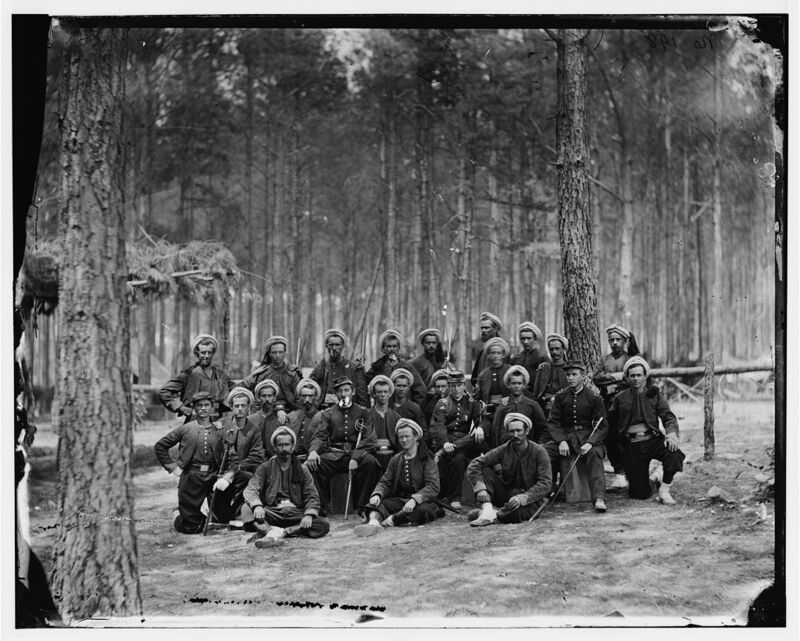 The South also had several regiments of zouaves the Louisiana or “Wheat’s” Tigers being the most famous. The men pictured above had their genesis as just such a company. Formed in 1861 by Charles Collis who became Colonel of the regiment when it was sworn into federal service. What is of particular interest is that this remained a Zouave unit this late in the war. Just a cursory look at their uniforms tells you they were not easily donned nor easily maintained. The beginning of the war saw many Zouave regiments enter federal service but after a year or so of campaigning the differentiated dress disappeared as the uniforms required replacement and had to be done at the expense of the regiment itself. Finding numerous items impractical for long term campaigning the regiments would adopt a more federal dress out of necessity. Personal or corporate purchase of certain items was not unusual for the volunteer regiments. Prior to the Tullahoma Campaign and the battle of Chickamauga, the entire brigade of Colonel John T. Wilder purchased, with private money (his own and that of every soldier in his regiments), the spencer repeating rifle. The War Department was fearful of adopting this rifle in quantity as it required a different style of ammunition (copper jacketed) and there was dispute that the soldiers themselves would be too careless with ammunition causing a waste. Wilder also mounted his infantrymen on mules or horses and turned his foot regiments into mounted infantry. These men here paid for the privilege of wearing the distinctive garb on their own (or from a fund established to ensure uniforms were replaced when worn out) and this probably explains why these men establish a uniformity of dress seldom seen in other federal units. I can only imagine how long it takes for these men to get into principle uniform, even just for these images to be taken. The number of items each is wearing means that the expense of keeping a Zouave unit in the field was also hefty as these items were not on the federal quartermaster’s list of supply. Zouave units designed their own uniforms and hence we have taken to calling them by the Colonels of the various regiments as means to describe the patterns. These men were called Collis Zouaves for their colonel and this also describes the pattern of the tunic, trousers, and headgear. a dark blue zouave jacket with sky blue cuffs and red trimmings and tombeux, a sky blue sash, madder red trousers, white gaiters, leather jamberies, and a red zouave fez with a yellow tassel that was often worn with a white turban. The man with the kepi and sword, far left of the image is in some dispute, in my opinion, as to his rank. None of the officers are in full kit and are only holding the image of their office, that of the sword. Shoulder straps and a sword were the visible titles of rank. I’ve seen this image and the caption described this man as an officer but I can only assume it was because he is holding a sword. Yet, a company 1st Sgt or Sgt Major would have as part of his uniform a sword denoting his command. The man does not have shoulder straps in evidence on his tunic (not a given but a little odd for an eastern unit) and if he has NCO stripes they are hard to discern from the image if they are of a darker material (possibly a darker blue). His belt would be another giveaway but both upper NCO and officers belt buckles were rectangular and not oblong like the enlisted men shown here. Like what you read? Then take a look at this!